The Brown v. Board of Education Jubilee Commemoration is a year-long, multi-faceted, and very ambitious project that bears the distinctive stamp of Chancellor Nancy Cantor’s interest in diversity in higher education. It is not an exaggeration to say that there is hardly a unit at UIUC that has not been touched by, or taken an active hand in the Brown Commemoration. The Ethnography of the University (EOTU) is pleased to take on the Ethnography of the Brown Commemoration (EBC) knowing that the commemoration—its particular shape and life on our campus—offers a window on the university’s diverse understanding of itself at this important historical juncture. Currently there are four paid undergraduate researchers attending Brown Commemoration events, interviewing participants, and writing up field notes that will be used next summer as undergraduates, graduate students, and faculty pull together a lengthy document that assesses the commemoration’s accomplishments. 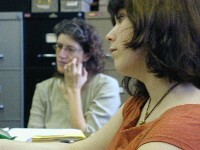 Although the Brown Commemoration has a distinct origin—namely, the recommendation of a Diversity Committee that resulted in Chancellor Cantor’s appointment of a Brown Commemoration Planning Committee—by today the commemoration is a very dispersed venture that has been realized by many units, constituencies, and individuals. For example, when the Housing Division engaged the Brown Commemoration, it naturally worked through its own chain of command, down to the resident directors, and from them to the resident assistants, and so on. There is, then, neither a single Brown Commemoration, nor a single vision enlivening the Brown Commemoration. Thus, in the day-to-day events and activities comprising the commemoration we find many and competing ideas about what it means to remember the Brown v. Board of Education decision, and what it means to commemorate it here and now. There are in turn the many consumers of the Brown Commemoration, ranging from people who attend commemoration events, to those in classes affected in some way by commemoration programming. Like the Brown Commemoration producers, these consumers bring a broad range of understanding to their encounters with the commemoration, and in turn they participate in the commemoration dialogue in particular ways. Furthermore, the Brown Commemoration takes on life beyond formal events, for example in off-stage conversations, in passions ignited by the events, and in the forging of new social connections. Clearly, the Brown Commemoration’s domain is expansive: in it are represented many and diverse visions, many and diverse consumers, and many and diverse after-lives. EBC aims to capture the life and feeling of some of this; we make no pretense to cover the commemoration exhaustively. Programming on race and diversity topics should not shy away from intellectual and emotional discomfort because discomfort prompts change, concludes a report on a historic year-long commemoration of the Brown v. Board of Education Supreme Court decision held at the University of Illinois at Urbana-Champaign in 2003-2004. This and six other recommendations for fostering successful campus dialogue on diversity are featured in the report, to be released November 27 by the Ethnography of the University Initiative hosted at the University of Illinois. These recommendations follow from an intensive ethnographic study by a commissioned team of faculty and undergraduate researchers who attended events, recorded field notes, and interviewed participants, audience members, and other key stakeholders. In addition to documenting the commemoration, which featured nationally and internationally renowned civil rights figures, the report reflects on the potential for undergraduate research to offer constructive feedback to their universities. Read all seven recommendations and the full report, "Ethnographic Report on the Jubilee Commemoration of Brown v. Board of Education" in a dynamic digital form at http://www.eui.uiuc.edu/archives/ebc/index.htm. 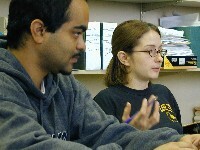 For more information about the Ethnography of the University, and promoting undergraduate research on the university, see http://www.eui.uiuc.edu. Contact person: Nancy Abelmann, 217-333-7273.